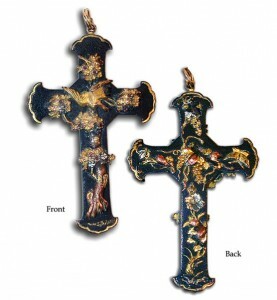 A major Double Sided Pendant Cross, this is the Japanese art of Shakudo in its most wonderful execution. Each side has a different & distinct design in gold and silver, bursting with symbolism. This is a unique, rare, and important piece. Perfect condition.